Hannah Senesh: Her Life and Diary, The First Complete Edition is extremely intense. I read this book straight through in one sitting (for the third time), and can’t say enough about it. From her diary that begins when she was thirteen years old…through just before her execution, to her poems and letters, the book is an extremely compelling read. The book also contains tributes by parachutists and some memoirs written by Hannah’s mother, Catherine Senesh. Catherine was in the same prison as Hannah, at one point in time, and they had fleeting conversations and glances at each other. Hannah, according to her diary, was always aware of how her decisions would affect her mother, and she adored and loved her mother without a doubt, but her (Hannah’s) passion for what she desired and believed in stayed in the forefront. We watch the years unfold through Hannah’s diary, and see how she has matured…from young teen, to a mature young women with definite ideals, opinions and pride in being a Jew. Her writings show a young woman torn between choices, sometimes questioning her choice, but always coming to the conclusion that she had made the correct one, for herself. Although, in her diary, she often stated that she did not like the synagogue atmosphere, the required prayers, she did believe in God, and Jewish life was what encompassed her dreams and goals and was what kept her passionate throughout her short life. She lived for Israel, for the Zionist movement. Israel and the Zionist goal was her ultimate dream, and she was determined to move there. When Hannah made “Aliyah”, moved to Israel, she was young and hopeful, filled with strength, ideals and dreams, and when she died, she was still young and hopeful, full of strength, ideals and dreams, some realized, but most of them not realized. Hannah was strong willed, courageous and true to her emotional and mental fortitude until the end very end, until the last minute. Even her captors could not believe the courage she exhibited throughout her capture and up until she perished. She was executed without a blindfold, by choice so her executioners could see her eyes, and she looked up towards the skies, and died a hero. Her life is immortalized within Israel. Hannah joined the military, trained and took parachute lessons as part of her training. She volunteered for a rescue mission to Europe during World War II in order to help rescue Jews, and was eventually captured, tortured and executed in Budapest by a firing squad. Poignant, beautifully written, Hannah’s life is a testament to her faith, ideals, strength, fortitude and determination to live life as she wanted to. It is difficult to articulate how Hannah Senesh: Her Life and Diary, the First Complete Edition affected me, as I am still filled with the emotions swirling within my mind and my heart from the powerful memoir. That one so young, so well-defined with her journal and poetry, could live such a short life, yet impact so many throughout the years since, is a testament to her very essence. Hannah Senesh’s life was not in vain, as she continues to teach others, each day, even in death. Her spirit lives on to inspire many, Jews and non Jews, alike. As an aside: The Jewish High Holy Days are near. Each year I read a few books, mainly biographies and non-fiction, relating to Judaism, Jewish individuals, the Holocaust, and/or Jewish Life. Some I read anew, and some I read again. It is my way of remembering Jewish history and all of the individuals who contributed to the welfare of the Jews. Behind Enemy Lines: The True Story of a French Jewish Spy in Nazi Germany, by Marthe Cohn is a compelling memoir. I was on the edge of my seat, reading her book. Cohn’s book is not only intense, but is illuminating and inspiring, as we watch her grow to adulthood. From Cohn’s childhood experiences fleeing and moving from one place to another in order to avoid the Nazis, to her getting a nursing degree and eventually to joining the French Army and becoming a spy, her life is a testament to her willpower, and also to her inner and physical strength. We feel all of her emotions: the fear, the heartbreak, the devastation of loss, the heart-wrenching familial deportations. Determined to get her family out of harms way was at the forefront of her mind, and every waking moment was spent working towards that endeavor. From documents forged by a sympathetic Frenchman, to a farmer in the countryside who helped her family to cross the border (and her family in turn helped others to cross), to the fact she had blonde hair and could pass as Aryan, Cohn took advantage of every opportunity given to her in order to save her family. Her memoir reads like an intriguing novel, yet is is a factual life accounting, and I read it straight through. Cohn was not tall, she was tiny and under five feet, yet her perseverance and persistence are the traits that helped her to try to make a change during the time of Nazi occupation in France. She defied all the odds, and she succeeded on several levels, impressing everyone around her. She and most of her immediate family were able to survive the German occupation of France, which is incredible. Behind Enemy Lines: The True Story of a French Jewish Spy in Nazi Germany is an amazing memoir about an incredible individual and her family. It is a must read memoir, and that Marthe Cohn penned the book and had it published when she was 82-years old is a gift to all of us, Jewish or otherwise. The historical value of her work is beyond words, and her life’s accomplishments and deeds needed to be told, and need to be read. I am the wiser after having read her incredible story, and I am grateful to Marthe Cohn for the invaluable treasure and legacy she has given me and all of humankind. I reread this book, recently, for a book club. Waiting For Robert Capa: A novel, by Susana Fortes, is a book that held my interest from beginning until the end, not only because of the photojournalism aspect, but also due to the romantic interests, and the historical aspect. Andre Friedmann, was a struggling photographer, living in Paris. He was a Hungarian exile. He had an assignment to take pictures for publicity purposes for a life insurance company. Within that realm, he finds a woman named Ruth Cerf, and asks her to model for him. Ruth was suspicious, and told him she was bringing a friend along. Her name was Gerta Pohorylle. From there, begins a story line that mingles fact with fiction, and encompasses a story of romance and photojournalism like you have never read before. Andre and Gerta become known as a couple. And, couple, they did (pun intended). They were two young and brilliant individuals trying to maintain a relationship and garner assignments in Spain in order to document the war. And, in order to do so, Gerta came up with the bright idea to change their names in order to gain recognition. First she changes Andre’s name to Robert Capa, eliminating his Jewish surname. She becomes his self-appointed “agent”. Eventually she changes her name to Gerda Taro. She wanted to be independent, and be recognized for her own work, rather than her photographs be included in Robert’s work without a byline. She literally became the first female war photographer who involved herself in the midst of battle. He became infamous in the world of photography for his extremely hardline images, leaving nothing to chance or to the imagination. To say they found themselves in unbelievable circumstances, is an understatement. They were right there, within the action, each one, documenting war through photography, putting their lives at risk in order to capture the ravages and horrors of war. Those efforts and circumstances changed the face of war photography forever. From that point forward, war was seen by millions of individuals in ways that they never imagined. His photographs depict tumultuous moments. Robert’s photograph “Death of a Loyalist Militiaman“, became the poster child, so to speak, for the Spanish Civil War. It is an incredible image, and one that depicts the moment of one man’s death, literally. With one click of the camera, he captured death as it occurred. He never lived that image down, due to speculation that it was staged. He denied it, but there were the nonbelievers. It followed him for the rest of his life. As a side note-I knew of Robert Capa’s war photography, especially his work regarding D-Day, and other images during that document World War II. I knew of Gerda Taro. But, I did not know about their relationship. I won’t go any further with details, because the novel is too compelling and intense. Suffice it to say, the love story is depicted with realism and deep intimate moments. The war angle and photography moments are intensely written and portrayed. Susana Fortes is masterful at keeping the reader interested, and masterful in illuminating her word images. I recommend Waiting For Robert Capa: A Novel, to everyone. The historical information, alone, makes it more than an excellent read. Combine that with the romantic story of two brilliant individuals whose work will live on, and keep their brilliance and efforts alive, and you have a book difficult to put down. To view some of the incredible photographs that were taken by Robert Capa, visit Magnum Photos. I was absorbed in all of them, but the ones from Italy 1943-1944 spoke to me, as my father was involved in the liberation of Italy. I was also amazed at the D-Day photographs, and remember seeing many of them while growing up, in various literary magazines and in newspapers. If you want to read an incredible epic novel, one that is stunning in its presentation, then The Invisible Bridge, by Julie Orringer is a novel for you. The Invisible Bridge is a saga, and a difficult book to review, due to its epic quality and the fact it is well over 600 pages long. The haunting historical novel begins in 1937 and takes the reader through the end of World War II. The story is told through a unique perspective, that of a Hungarian Jew named Andras Levi. Andras has gone to Paris to study architecture, where the opportunities are greater, leaving behind his family in Hungary. He has two brothers, Tibor and M, and they are very close. The familial bonds are extremely strong. While in Paris, Andras meets an older woman named Klara who is also a Hungarian Jew, with a teen-aged daughter. Her background is a bit mysterious and the reasons for her being in Paris are not immediately evident. An affair begins between the two of them, which eventually turns to love and romance. Due to circumstances and the antisemitism prevalent against Jews in France, Andras is forced to return to Hungary. He is eventually conscripted into the work labor program. That is where the more horrendous part of The Invisible Bridge begins to transform itself into an historically intense story of wartime horror. Orringer leaves nothing to the imagination, and the word imagery is stunningly detailed. She includes every minute detail into The Invisible Bridge, and the reader’s senses are filled with the sights, sounds, scents, tastes and touches of daily life. Life in the work labor camps is depicted with depth and strong visuals. The adverse conditions (that is putting it mildly), and the atrocities are told so strongly that the reader feels as if this is a personal family memoir and saga, as opposed to being a novel. As The Invisible Bridge progresses, the reader watches the relationship between Andras and Klara develop. The reader sees Andras growth as he turns into an emotionally mature man, not only thinking of himself, but of Klara and his family that he has left behind. He is willing to sacrifice his life, sacrifice anything for her safety and the safety of his family. And, Klara in return, is willing to do the same, always cognizant of the fact that Andras’ safety is in danger. Each partner is concerned with the other. That is the beauty of The Invisible Bridge. Love transpires and evolves within the harshest of circumstances. Love flows from one event to the next, never diminishing, but growing stronger. As the hours and days move forward, Andras’ thoughts of Klara are what continue to give him the motivation to find a way to survive the horrendous nightmares set before him. I became totally involved in the book and the characters who felt very real. I wanted to know more about them, and wanted to continue to learn more regarding their daily situations. There is so much more to The Invisible Bridge than what I have written, but to include more details would reveal too much of the story line. You need to read it for yourself, and inhale the depth of the saga. Orringer has researched the events that transpired in Hungary during World War II to the utmost of standards, perfection and reality. The events, described so brilliantly, give the reader insight into the little known aspects of what transpired in Hungary during World War II. There isn’t much information on that subject. What we read, as far as the events and audacious circumstances, did occur. She did not white wash anything, yet she wrote magnificent details with beautiful and superlative prose. Julie Orringer’s brilliant writing illuminates the pages with intensity and sensitivity. The reader can discern that her heart and soul were within the words, lines, paragraphs and pages of The Invisible Bridge. It is a beautifully written historical novel that pays tribute to not only the Hungarian Jews, but to familial ties and relationships. It is a metaphor for love and war, yearning and loss, strength and survival under the most adverse of conditions. I highly recommend this book to everyone. Flags of Our Fathers: Heroes of Iwo Jima, by James Bradley and Ron Powers is an extremely important contribution in detailing the intense battle at Iwo Jima. The book is filled with graphic word-imagery, and with the compelling and classic photograph taken by Joe Rosenthal of six Americans raising the American flag at Iwo Jima. The aftermath of war, and of those six men has been haunting and tragic for some of them, and for some of their family members. James Bradley is the son of John Bradley, on of those brave men who braved the dangers of war to signify patriotism and American ideals. Read this book, it is a must, for young and old alike. My father was in the army during WWII. He saved clippings of this image, and the image has stayed with me through my life. 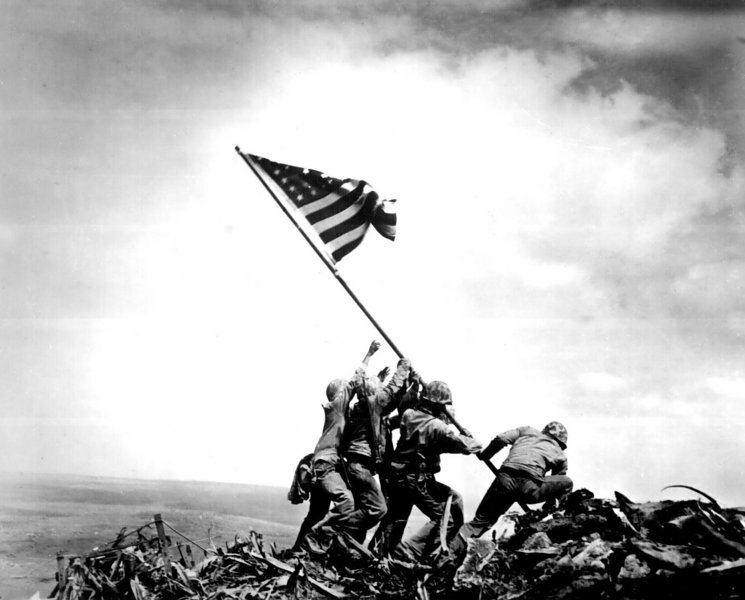 Today, February 23, 2015, is the seventieth anniversary of the Pulitzer Prize winning “The Raising of the Flag” photograph, captured by Joe Rosenthal. The U.S. Marine Corps War Memorial depicts the specific flag raising at Iwo Jima. It is heartfelt and awe-inspiring to see in person. Sorry for the update-I left a link out. The Butterfly and the Violin, by Kristy Cambron is a story focusing on the Holocaust and a particular painting. The story bounces between pre-World War II, events occurring during World War II, and the current time period. A painting of a woman, hair shorn, holding a violin, is the glue that bonds two specific individuals together, as they try to find out information regarding the painting, and locate the owner of it. During their research, they become deeply attached to each other. Each person has their own past, their own secrets they are withholding. Unfortunately, the story did not speak to me, or have me gravitated to like any one particular character. I felt the modern day characters were weak, not realized and did not feel any attachment to them, and I thought they were lacking in substance and depth. Their superficiality flowed throughout the pages. The relationships that develop, which include a young child, do not seem to be realistic, as to occurrences, within the relationships. The ending was extremely disappointing, and left me devoid of a final conclusion. Some Holocaust-related truths were infused within the pages. Events and modes of operation were depicted, along with visuals that the reader could “see” before them. In that aspect, the word imagery was defining. Unfortunately, that information is colored by the novel deviating from the story, about one third into it, to include an overtone that over powers the Holocaust issue. What I thought was going to be a serious novel regarding the Holocaust was more of a novel with loose ends, a novel not for readers who want an intense Holocaust story. The Butterfly and the Violin, by Kristy Cambron, in my opinion, would be better served as a book for teenagers and young adults (early 20s). The novel, Love and Treasure, is a book with three distinct stories, that connect. I liked the first two stories, especially the information regarding the “Gold Train”. I had not known about that historical event before reading the novel. I found that part fascinating. In the first story, Jack is a soldier in Salzburg guarding the “Gold Train” at the end of World War II. He is cognizant of the fact that the items on the train belonged to Hungarian Jews. As the days go by Jack finds it arduous and difficult to protect the items, not necessarily from looting, but from the commanders of the army wanting to requisition some of them in order to elevate their lifestyle. Silverware, china dish sets, candelabras, crystal, bedding, etc., all fall prey to the hands of the military authorities. Jack finds a locket, and in an impulsive move takes it. He eventually gives it to the woman he loves, Ilona, a Hungarian Jew released from a war camp. The reader is taken on a journey through Jack’s moral code, and how it affected his entire life, up until his dying days. As he lays dying, he gives the locket to his granddaughter, Natalie. The locket holds a photograph of two women. He asks her to find the owner of the locket, which means she must travel to Europe in order to do so. Natalie is reluctant, but does his bidding. From Budapest to Israel and points in between, the story moves through time and location. Natalie’s search results in meetings with individuals who have been trying to move on with their lives. It also results in her meeting an art dealer who is trying to find the source of a painting, a painting which revolves around the locket. Her research garners her information regarding possible links to the locket. The information also connects her to people who were circus performers and who were part of the wealthy and artistic scene. I felt the story dragged on, once I got past the second story. The third story seemed absolutely unnecessary to me. It held no relevance to the first two stories. I felt it could have been narrowed down to a few pages of information inserted within the second story. Overall I would rate Love and Treasure a 3 out of 5. All rights reserved © Copyright 2006 - All Rights Reserved - No permission is given or allowed to reuse my book reviews, writings, or my poetry in any form/format without my express written consent/permission. I want to thank you all for your kindnesses and consideration in giving me blog awards. I appreciate each of you for doing so. I do not accept awards. It is not the purpose of my blog. Thank you, again.